What do the critters of the rainforest get up to when they wake up at night? Feed their hungry bellies, of course! This colourful book of rhyming verse explores the eating habits of a variety of rainforest creatures. The book comprises a series of vignettes rather than a narrative plot. 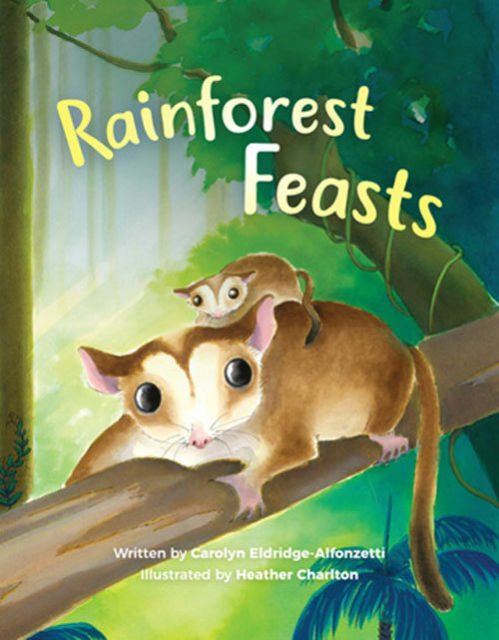 The unusual selection of animals and insects Eldridge-Alfonzetti has featured, including crayfish, native rats and glow worms, distinguishes the book from comparable titles. The watercolour illustrations are bright and colourful while still conveying a sense of the night-time forest setting. Each spread shows the featured rainforest creature and its prey, often in the act of capturing or eating the meal. Some critters are rendered with a greater sense of character and likeness than others, and not all are perfectly consistent throughout. Nevertheless, young children will enjoy the double-page spreads. The final spreads will particularly enthrall young audiences, with a challenge to find all the featured creatures in both a daytime and night time setting. This book would form an engaging yet relaxing part of any young child’s bedtime routine and is particularly suited to 3 to 8 year olds. With its large, bold illustrations and many springboards for discussion, it would also fit well into a junior primary classroom.